It's hard to believe that a week ago I was still basking in the Caribbean sun. Today's post is dedicated to the outfits we wore while we were down there. My friend Jamie is quite the fashionista herself. And when you take a look at our mothers, there's no question where we get our style from. They're always well dressed and perfectly accessorized. Jamie is wearing an Old Navy maxi and I'm in a BCBGeneration romper. Enjoying matching cocktails! I love this floral French Connection dress with the studded neckline... especially when paired with a tan! Comfort is key when you're traveling for almost 12 hours. I wore this Victoria's Secret maxi dress and threw an H&M poncho over it when I arrived in cold Boston. I love the print on both of these dresses. Not to mention the gorgeous turquoise necklaces! I finally got to wear one of my Jason Wu for Target finds! And my favorite Michael Kors wedges. Can you believe the necklace my mom is wearing came from a vendor on the beach? Beautiful! As the pictures show, we lived in cute but comfortable dresses the entire week. How do you like to dress when you're on vacation? Do you dress to the nines or dress for comfort? Hello again! I'm back from an amazing 8 days in Punta Cana, Dominican Republic. The weather could not have been more perfect. It even poured rain the day we left, making it MUCH easier to leave. We arrived to find out that part of our resort had burned down (see video here) two days prior. Luckily we were given access to the beautiful sister resort next door so we made the best of it and ended up having a great time. Here are a couple of my favorite shots... more to come next week! Is there anything more beautiful than turquoise water? White sand -- ahhh take me back! See you Monday with Part 2 of my vacation diary! Happy Friday! It's finally here! My much-anticipated beach getaway has arrived. 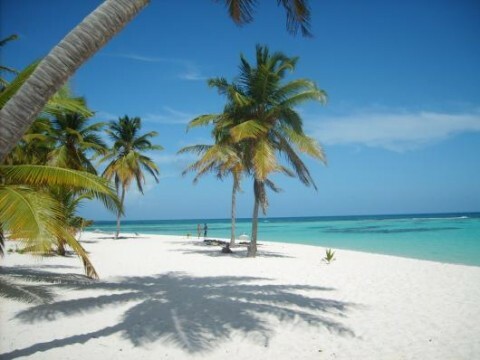 I'm so excited to be spending the week in Punta Cana with my mom, godmother and one of my best childhood friends. Please forgive my silence over the next several days -- I'll be back on the 26th armed with stories and beautiful pictures! Want to see how I packed for this trip? Check out THIS post! J and I took advantage of the gorgeous weather on Sunday and headed down to one of our favorite spring/summer eateries -- Tavern on the Water in Charlestown. Enjoying a tall Dark & Stormy while overlooking Boston Harbor is my idea of a perfect day. It's still a bit cool in the breeze so I opted for a blouse and my comfy J.Crew cafe capris (the perfect alternative to jeans). Unfortunately my shoes are sold out online but there are still a couple other cute colors available! Plus they're 30% off right now! Check them out HERE. Like my capris? Get them dirt cheap! $50 + an extra 30% off using coupon code MUSTHAVE. Order them HERE. Happy Monday my loves! Hope your weekend was a good one. It's Marathon Monday here in Boston and I'm pretty sure yours truly is the only one who has to work. Good luck to all the marathoners out there! I wore this adorable trench this past weekend to run a couple errands. I love that it's a twist on the typical trench coat. I used to be one of those "no white before Memorial Day" types but you know what? Rules are made to be broken, right? Do you wear white before Memorial Day? What other fashion rules do you like to break? Well hello, gorgeous! This is the Lindsey bracelet from hot Hollywood designer CC SKYE. It's meant to be, is it not? 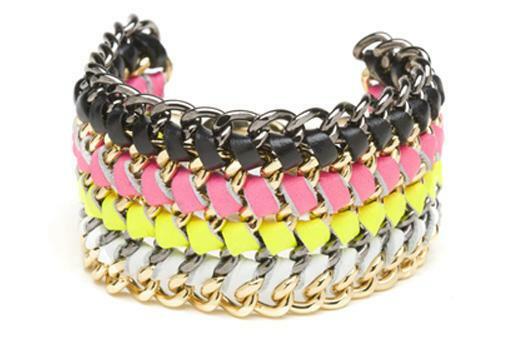 A bracelet with my namesake in beautiful neon leather and trendy hardware. I might have to treat myself to a (very) early birthday present! What are you currently craving? Are you noticing a trend here with my recipes? "Easy" this, "easy" that. I love recipes that are simple yet so delicious, no one would ever guess that they only take a few ingredients and a few minutes to make. Mix yogurt, cool whip and pudding packets together and stir until combined. Layer cream mixture with berries. That's it! It was such a hit Easter Sunday that it might make an annual appearance from now on. I also used low fat, fat free and sugar free ingredients and you would never know. So not only is it yummy, it's pretty healthy too! Win-win. The combination of comfortable yet stylish jeans and a cute, colorful blazer has been my go-to outfit as of late. My uniform. When the weather doesn't quite allow for short sleeves or bare legs, and a jacket is too much, I reach for one of my many blazers. I love the bright pink color of this particular one, especially when paired with my Stella & Dot Bamboleo necklace. Can you tell it was a bit windy when I shot these photos? Please excuse my crazy hair! I love this lake in Wakefield... wish I lived a bit closer to it so I could photograph by it all the time. One of the recipes I made yesterday was this Easy Mud Pie with homemade chocolate sauce. Sooo yum! Hope everyone else had a wonderful Easter. Woohoo! Outfit posts are finally back! The weather has been cold and dreary the past week or so and I don't really like taking pictures inside so I apologize for my lull in posting. I typically take my outfit pictures on weekends but decided to switch it up a bit and show you guys what I tend to wear Monday-Friday. That's right, boring office wear. I try to spice it up with fun prints and bright colors. I love being the neon yellow cardigan in a sea of black suits. Hope you're all having a wonderful week so far! 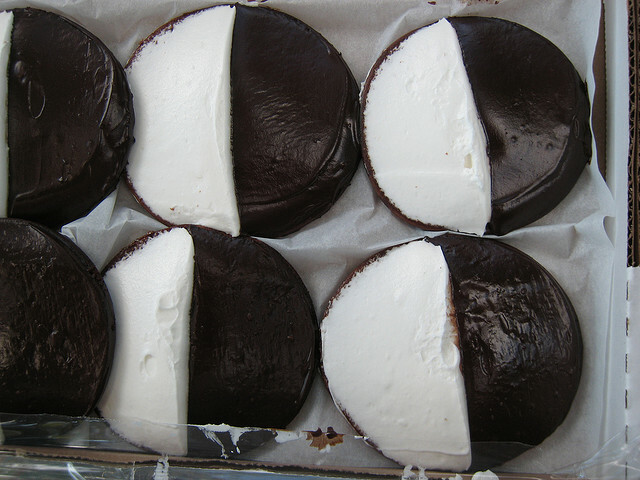 New Englanders also refer to it as the "Black & White Cookie". But I've found that more often than not, this impostor cookie is dry and flavorless. There are tons of delicious bakeries in and around Boston, but they should truly stick to Italian pastries and cupcakes. Leave the half moon cookies to the people from my little neck of the woods. The major difference between an Upstate NY (i.e. Hemstrought's) Half Moon and a Boston Half Moon is the cake. The bottom of a proper half moon cookie is moist, chocolately, and what I can only describe as a mix between a cake and a brownie. And of course, sturdy enough for both types of icing. The chocolate icing should be glossy and thick. And the vanilla icing fluffy and not overly sweet. Oh, and just an FYI, there is no such thing as a vanilla half moon. That's like Derek Jeter in a Sox uniform -- it's just WRONG. Preheat oven to 350F. Mix sugar, margarine, cocoa, and salt. Beat until fluffy. Add eggs and vanilla. Add half milk and half flour mixture (flour, baking soda and baking powder). Mix well. Repeat with remaining mixture. Spoon cookies 3" around and 2" apart. Bake 12 minutes on a cookie sheet lined with parchment paper. Cool completely. Buttercream -- mix ingredients together until light and fluffy. Frost cookies with half chocolate, half buttercream. Store in air-tight container to ensure they stay fresh. Add food coloring to buttercream to create pastel half moons just in time for Easter! It might take me the entire week to recover from the sleep lost this past weekend, but I wouldn't trade the time I spent with my cousin and her kids for the world. We had such a great time playing, taking walks, shopping & cooking. Below are a few of my favorite shots from the trip. If you've never been to Maine, I'm telling you, you're missing out big time. Winding roads along the coastline, quaint houses, and the friendliest people you can imagine. The closet thing I've had to authentic churros since Mexico. They were amazing and the rest of the meal was up there with some of the best food I've ever had. Jamie & Kim -- best couple ever. Love them!